The Social media Giant Facebook suffered a service disruption on Friday that made the website unavailable to some users for more than 30 minutes. What was next, Twitter was flooded with tweets related to Facebook down time, creating a buzz around the globe making it to the lists of worldwide trend. Pressing Help also took back to the same page and pressing Go Back also did the same. The chats were not loading making it difficult for Facebookers to chat with each other. 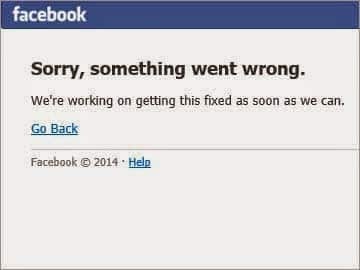 Don’t panic, but Facebook is down. I SAID DON’T PANIC. Facebook goes down and thousands of people go outside, blinking into the sun. This is the second major outage in the last two month, Facebook suffered a similar outage in mid June this year. The Social media Giant is up and running fine now however Facebook has yet not responded to comment over the downtime. At the time of writing this article, the Facebook is still giving problems though it is up.